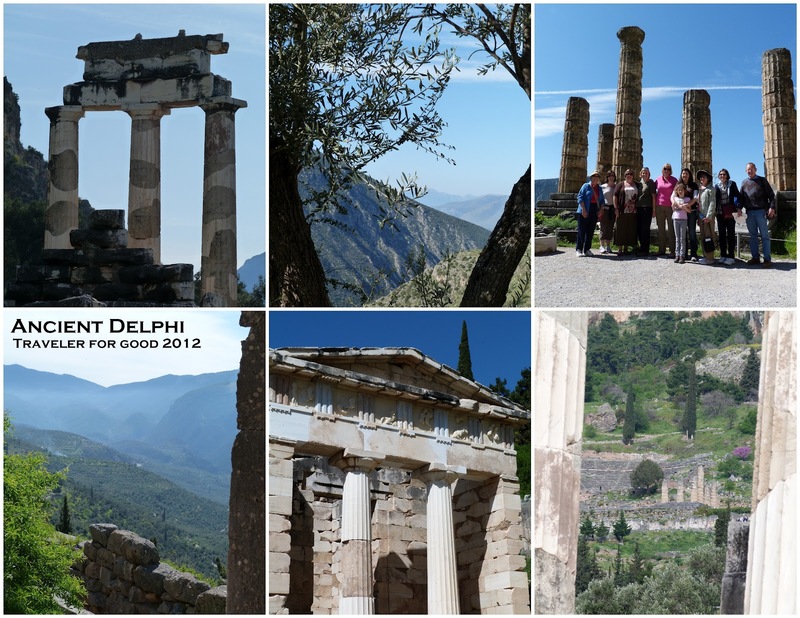 After a beautiful evening in the village of Delphi, we lucked out the next morning with nice weather as we explore ancient Delphi. My only exposure to Delphi prior to visiting Greece was the clip in My Life in Ruins where they ask questions of the "Irvicle." We went first thing in the morning and didn't have to compete with many other tour groups. We started at the Temple of Athena and then moved across the street to the Oracle. The original thought was that the Oracle was a young virgin, but apparently they aren't as trustworthy (or maybe they run off to get married), so the Oracle was then a "mature" woman who had passed her childbearing years. And got high on a lot of natural gasses and maybe some form of wacky weed as well. All the big cities would have their temples on the road up to the Oracle. They would bring a gift from home, or buy one in the village and present it at the temple. After making their request to the Oracle and hearing from the priests/priestesses the response, they would stop back in the village and purchase a gift to take back home to their family. #1 One man asked if he invaded a particular place if he would be victorious and was told "one kingdom will fall." He took that as a go ahead. Not realizing the kingdom that would fall would be his own. #2 The other prophesy was regarding the establishment of Byzantium (now Istanbul). He asked "where should I move my family?" He was told to sail the Bosphorus and settle opposite of the blind people. He sailed in, saw a spot so beautiful that he settled. The implication was that the people on the other side of the Bosphorus were "blind not to see it."